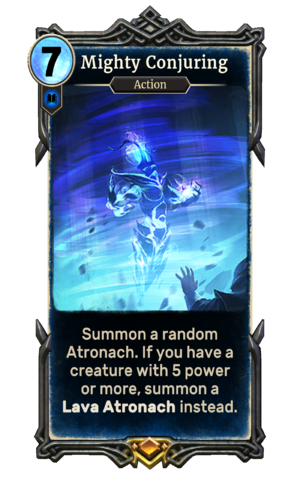 Summon a random Atronach. If you have a creature with 5 power or more, summon a Lava Atronach instead. Mighty Conjuring is a legendary Intelligence action card. It is part of the Houses of Morrowind expansion. This page was last modified on 24 September 2018, at 23:01.